Yesterday we were In Search of the Holy Grail in the form of one of our rarer avian garden visitors, a Treecreeper. No sooner had we been thinking, “wouldn’t it be nice if we got a shot of a Treecreeper”, than a pair of Treecreepers dutifully turned up and provided at least a long distance (minimal) shot. Today we were discussing, amongst ourselves (as you do), what other less than frequent visitors we might like to capture on pixels. A Blackcap sprang to mind. A Blackcap sprang to mind largely because we have seen one just a couple of times in the 20 years that we’ve lived here. “Dream on”, I said, wittily, “we’ve only ever see A Blackcap once or twice”. This afternoon I popped out to visit my mother en route to an afternoon U3A Digital Imaging Group meeting. As usual we discussed very little to do with digital imaging but had a nice cup of tea and a biscuit or two – a bit like giving blood, really. [Ed: Life gets terribly exciting sometimes, doesn’t it?] Upon my return what does Carol proudly show me on the rear screen of her camera? 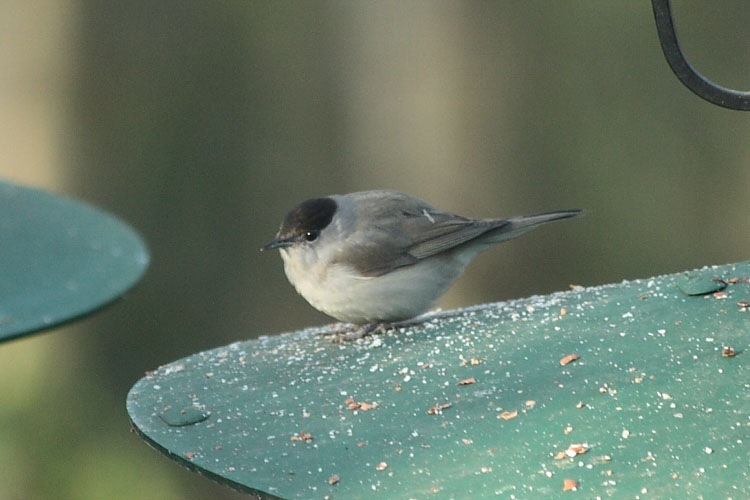 Two pictures, very nicely taken, of a male Blackcap sitting hunched up on the squirrel baffle of one of our bird feeders. Her pride was very justified. 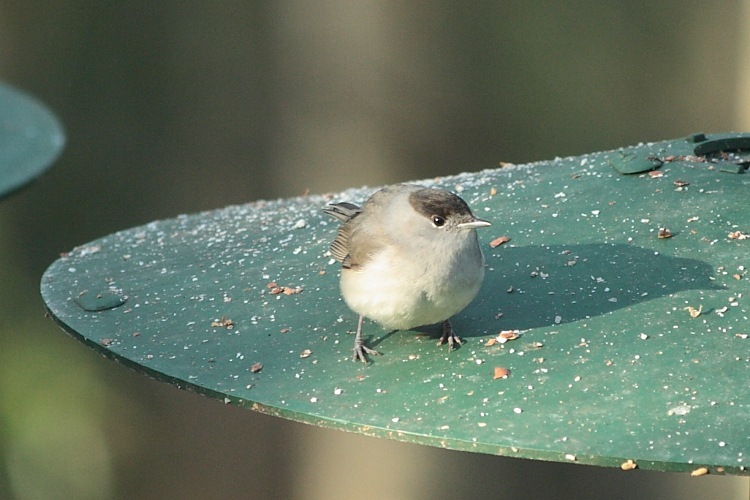 “Yikes”, or words to that effect, “it’s a Blackcap!” I couldn’t believe it – on two days running we get a talk-of-the-Devil-and-he-shall-appear kind of moment. Tomorrow I think I’ll start a discussion about Siskins; we haven’t seen them yet this year.